Chrony LED Lamp rechargeable battery pack can power the Chrony LED Lamp for more than 18 hours of continuous use. It can be recharged from the cigarette lighter plug in any vehicle or from any 120 volt wall outlet. 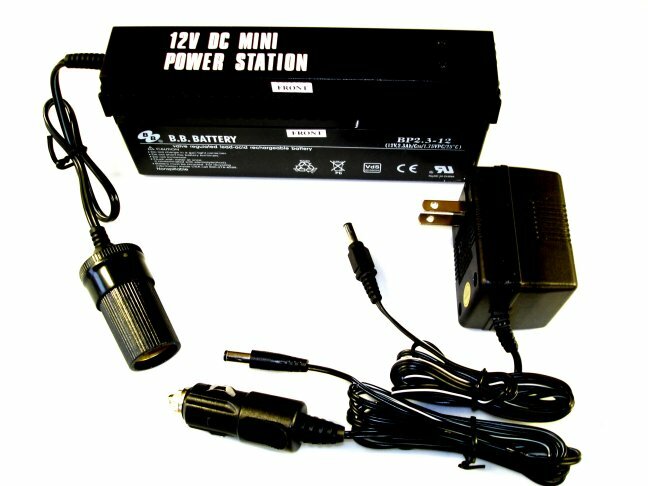 Not limited to powering just the Chrony LED Lamp, this is actually a Universal 12V DC Mini Power Station that will power anything can plug into a vehicle cigarette lighter power socket: Cell phone rechargers, mini-computers, flashlights, heated clothing, etc. The kit includes the rechargeable power station, AC Adaptor, and 12v cigarette lighter adaptor.